Steampunk makers have designed some interesting (and some bizarre) projects and devices based on the sub-genre of sci-fi. Everything from small mechanical spiders to the Arts et Metiers metro station in Paris have taken on a steampunk aesthetic and now we can add emergency lighting to the list thanks to Instructables member Junophor. 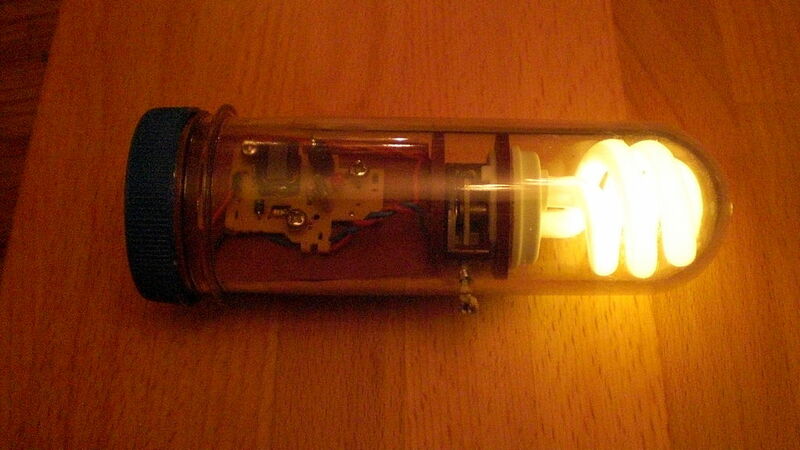 The steampunk enthusiast designed his ‘Emergency Light using a CFL lamp and ‘steampunk technology’. The technology in question is actually the electronics from a Fuji disposable camera, which is housed in a PET preform tube and powered by an AA battery pack. The camera’s voltage regulator was modified to accept the 1.5V of the AA batteries (3V total) by stripping away the capacitor along with the flash module and copper blade switch. He then soldered an old ‘string-pulled’ on/off switch to the board, which is routed through a hole in the side of the tube. While the emergency light looks great with its steampunk overtones and it’s fairly cheap to build, it wouldn’t be practical in emergency situations that require high lumens and reliability. But, you would be the coolest in the disaster zone, that’s for sure!